It is now more than a year, from June 9, 2017 to October 2018, since I arrived in Saanich Penin-sula Parish after a brief introduction to Canadian culture and way of life in St. Ann’s parish, Dun-can. Thank you for the warm welcome that made me feel at home and easier to adjust to the new environment. For two months I started to familiarize myself with the four First Nations Reserves within the Parish territory. Later, there was a First Nations funeral for an Elder, Pamela, held in their gym-nasium and I was privileged to observe Native burial traditions, including a Reception afterwards where all who had helped the family in any way were thanked. Sarah Modeste, an Elder from Duncan, together with her daughter, Freda, visited with me and took me to the Tsartlip Reserve to visit members of the Sampson family & Thelma and Cristy Underwood in their Social Welfare Office. I felt their acceptance and support. They invited me to attend the Pow Wow. Again, it was an opportunity for me to observe their cultural practices for three consecutive days. During the event, Maurice, an Elder, introduced me to the communi-ty gathered there. Norman Underwood, Tswaout Elder invited me to visit him at his home and was invited to attend his birthday celebration and later to their Thanksgiving dinner and intro-duced me to family members who were preset and announced that I would be celebrating Mass in his home. A week later I celebrated Mass in his home with 13 family members attending. In the first week of December there was a funeral at the Pauqu’achin Reserve for a member of the Williams family. They asked me to bring Rosaries and lead them in a prayer service. I felt accepted by their community. The next day there was a funeral Mass which I celebrated, fol-lowed by a reception. As part of their tradition and culture I was offered handshakes by family members. On Christmas Day I celebrated Mass on the Tsawout Reserve attended by 28 Band members. But for the snow, more had planned to attend. On Good Friday, 2018, a service was held at Tswaout Band Office with 9 Elders and a few pa-rishioners attending. Gradually, some First Nations families have invited me into their homes. On September 12, 2018, I celebrated Mass in Norman Underwood’s home together with 30 family members, in-cluding one family from Tsartlip and one family from Tseycum attending. Now, every first and third Fridays of the month I bring Communion to Norman, Thelma and Geraldine Underwood in their respective homes. I have been invited to join his family for Thanksgiving Dinner. On the social side of life, Scott Sam took me out for a day’s fishing in the Salish Sea and we came home with fresh fish for his family. 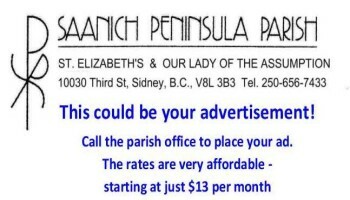 Historically it would appear that the majority of the four Coast Salish peoples forming the four Reserves in Central and North Saanich were baptised and raised in the Catholic faith. Tswaout Reserve had its own Cathoic Church and Pastor, and still has a street named Church Rd. where the Church was situated. On the occasion of Native cultural events, I have been contacted and have contacted them in order to participate. I have been invited to attend funeral ceremonies at the Shaker Church on the Tsartlip Reserve and to participate. The history of Residential Schools, the banning of Potlach ceremonies appears to be defining moments in Native families choosing to return to their traditional beliefs. My presence and ministry among them is not one of proselytism but of healing, of friendship and support. Truly I tell you, whatever you did for one of the least of these brothers and sisters of mine, you did for me." As you probably have heard from the various news outlets the clergy sexual abuse scandal and the cover-up by some bishops has resulted in all kinds of accusations and abuse thrown at Pope Francis (and I have to say at other clergy and church people). We have to unequivocally condemn the sinful and terrible behaviour and ask forgiveness from those who have suffered greatly: the abused, their families, their faith communities. We need to work towards change which will hopefully prevent this abuse of power. At the same time we need to understand that the necessary changes cannot always be instantaneous, that some will need reflection and time. We live in a world of instant gratification and demand for solutions now! That cannot always happen. Let us go beyond our anger and frustration and pray for and move towards wisdom, patience, and guidance of the Spirit. Some Bishops have asked for Pope Francis’ resignation. That call comes from people who have never agreed with Francis’s frank, humble and simple approach. The overwhelming majority of the people of God and of the clergy, religious, bishops are very supportive of the fresh spirit that is blowing. Here is a letter written by a Brazilian Priest, Fr.Antoine Teixeira, which echoes my & I am sure your feelings: “Dear Pope Francis! Actually, you're guilty! You're guilty of being a man and not being an angel! You're guilty because you have the humility to accept that you're wrong and ask forgiveness. Ask forgiveness for you and for us. And that for many is unacceptable. You're guilty because you didn't want to be a judge, a man of law, and you're an example and a testimony of mercy. You're guilty because you abandoned the tradition of living in palaces and chose to live like ordinary people. Guilty because you left the sumptuousness of Saint John of the Lateran and preferred to visit the poverty of prisons, orphanages, hospitals, etc. You're guilty! You stopped kissing the perfumed feet of the eminences and you kiss the " dirty " feet of convicts, women, sick, people of other religious denominations, people " different "! You are condemned because you opened the doors to the refugees and because in front of painful and waiting subjects you simply answer: " who am I to judge?". You are doomed because you assume your fragility by asking us to pray for you while many require you to be dogmatic, intolerant and regulatory. Pope Francis, you are guilty of so many so-called "infidels", "excommunicated" and "impure" who have rediscovered, thanks to you, the beautiful face of Christ full of tenderness and mercy. You're guilty because " you call things by their names " and you don't stop reminding the bishops that they're not airport pastors but must wear " the smell of their sheep ". You're guilty because you tore the pages of intolerance, Sterile And Ruthless Morals, and you offered us the beauty of compassion, tenderness and sincerity. You're guilty because you opened our eyes, those of intelligence and reason but especially the eyes of the heart. You are guilty of wanting to carry the cross of the church instead of diverting the look, being indifferent to the pain and tears of the men of our time. You're guilty because you can't stand the heinous crimes made in the name of God and those who speak of God but live against him. You are guilty because you seek truth, justice, by mercy, instead of silence, hide, minimize or ignore. You're guilty because you don't want a church of privileges and benefits, glories, and you teach us the strength of service, the wealth of the foot enema and the greatness of simplicity. Pope Francis, let yourself be blamed for these "crimes". You know that by your side they are countless the men and women who, like you, are not angels, but fragile people, sinners, who hope that Christ watches over us and for us. You know that with you there is a huge procession of hearts that pray for you every moment; for you they would risk their lives. They follow you like sheep who trust their pastor. It was Christ who put you at the helm of this "boat" that is the Church. Christ will give you the strength to pursue this path of "guilt" that has done so well in the world and church. Dear Pope Francis, thank you for being guilty of making beautiful the Church of which Jesus dreamed.